Is it really Wednesday? You would think with this being the last week of school for the kids the atmosphere at work would be fun and light, but man, it just seems to be heavier and heavier every day. It is time for vacation already. Thankfully I have art and all you great people who stop by my blog and that helps sooooo much to break the stress. So thanks for reading my belly aching. Today I am have another page for Art Journal Journey. This month the theme is maps, hosted by Mary. I have another space page, and although this came out of an atlas, it might be more of a diagram than a map of the solar system. But I am going to take a bit of leeway and call it a map. The quote really represents how I feel right now, although I really don't have any desire to spend years in a space ship traveling to other planets, But as you can tell, I really have a desire to be off the grid at work and away from my coworkers (many who are good friends of mine) for a little bit at least. 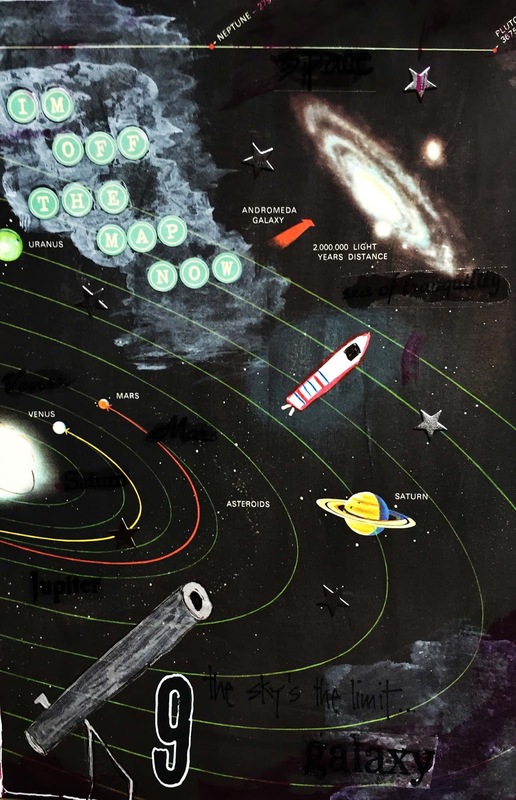 I used the entire atlas page as my background (the rest of the solar system is on the other page in the atlas still), and I drew and painted in the telescope and the rocket ship. I added some little metal stars, a bit of white nebula looking paint, the number 9, the letter stickers and also some stamped on acetate space words. They are kind of hard to see in the picture, but in person they stand out just enough from the black background as to not be too bold on the page. I am also linking up to Try It On Tuesday. The theme is all about him, and I think space travel (although not strictly masculine) works for that theme. Hope everyone enjoys their day and can you believe we are at the middle of June already? Out of this world art journal page!! Fun!! It's nearly time for summer holidays! I bet you can't wait. Your journal page is great about outer space. It is a place I sometimes want to go when I am frustrated by things happening in the world. Oh nice work, Erika, something quite different. It won't be long until you can fly off to the space of your vacation. Have a great one. Well, here it is Thursday already and I'm just now spending quality computer time. I hope your school has a councilor, because I can't even begin to comprehend what these kids are going through, especially ones who may identify with the LGBT community. I don't know which is worse, this, the worst massacre in our history, which targeted young people trying to be themselves, or the massacre that took so many grade/grammar school aged children in their classrooms. Both are senseless and both targeted what I believe are innocents. OK, off my soapbox. Loved the solar system, and that is TOTALLY a map! I like that you thought outside the box. Two more days? Can we begin the celebration soon? Obviously not soon enough for you! No wonder that you wish to be on holidays! Just a few days more - and then it's done! What a super page! Great! I would love to travel through the space and especially I would love to see our earth from the space... must be fascinating. Thanks a lot for another incredible page for AJJ and that you join Try It On Tuesday as well! Really fun take on the challenge Erika. You must be excited with your count down to beginning of summer! Oh what an escape that would be to explore space. Its a fantastic page and I am so pleased you shared it with us at TioT's as well. Hi Erika, This is a great page and it fits the theme perfectly.